Kaiji, down on his luck (as usual), got dragged into an underground extension of the Teiai Corporation to work as a hard laborer. The jobs are dangerous, the wages are meagerly, and the food is bland. During every payday, Ohtsuki and his lackeys sell overpriced yakitori, beer, and nuts. Kaiji, unable to resist temptation, usually splurged his money on "luxury" foods, dashing his hopes of reaching 500,000 perica for the one-day vacation to get out of there. Ohtsuki then told them about the game of underground chinchiro, a dice game in which he can win money. 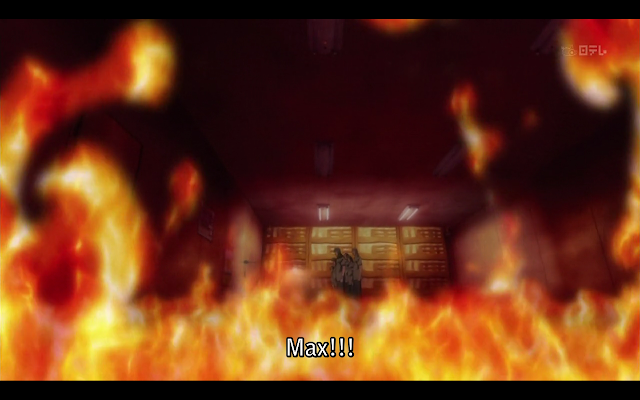 Of course, Kaiji lost, and even ended up in debt. After looking over the results that Miyoshi wrote down, Kaiji realized that Ohtsuki was using a trick to win. After surviving bouts of bullying and not spending his pay, Kaiji and his group of fellow losers planned a counterattack. Kaiji proposes that Ohtsuki slash the rule of betting limits. 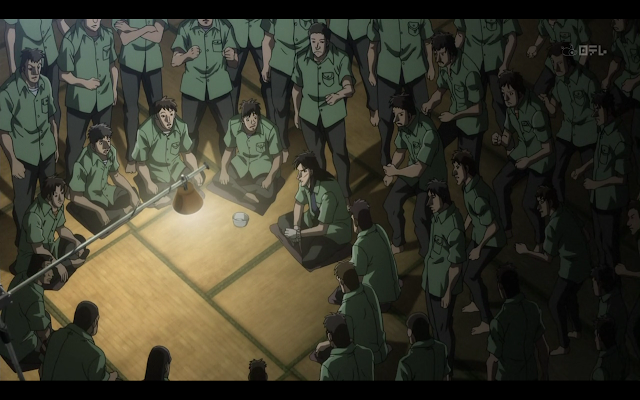 Ohtsuki accepts, and this draws in a throng of inmates, because this is the highest form of entertainment for them. 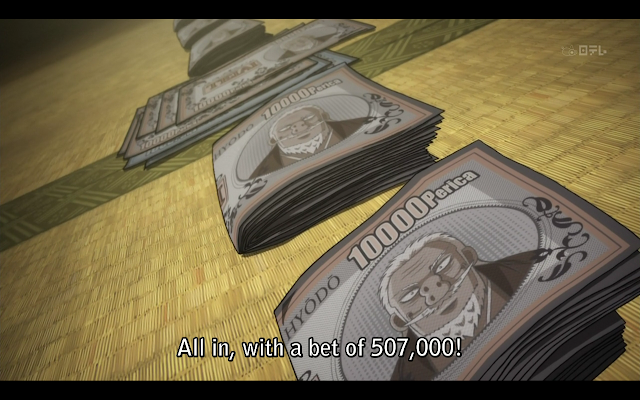 They are extremely disappointed that Kaiji only bets 20k perica, which is under the old limit. Ohtsuki's lackey deals first and rolls a 4-5-6. Kaiji only rolls a 2, so he ends up paying 40k. He then bets 1k perica, again to the disappointment of the crowd. He ends up being down 39k. However! This has all been part of Kaiji's plan. Now that it's Ohtsuki turn, Kaiji confirms that Ohtsuki is dealing twice with no betting limits. He then motions to the people in his group (Group 45) to move in. They, along with Kaiji, bet all that they have: a grand total of 507k perica. That's when Ohtsuki realizes that Kaiji had planned this all along. 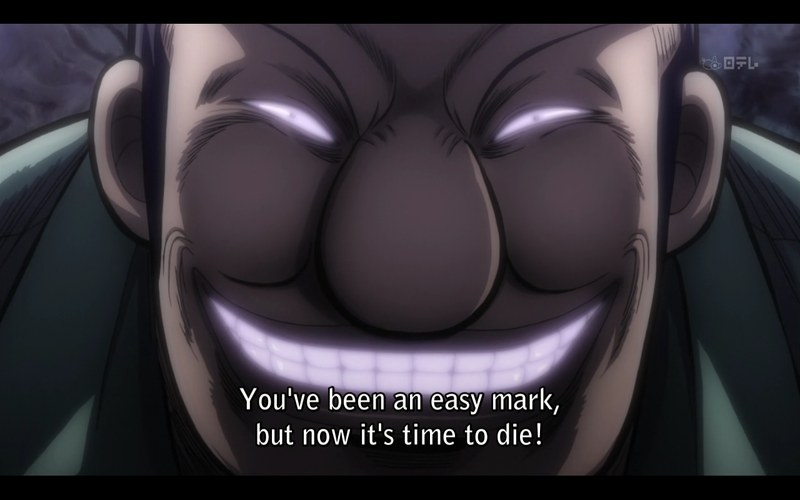 Personally, I felt that this was a rather slow-moving episode, even considering that this is Kaiji-paced. Maybe it was just me, eager to see what kind of trick Ohtsuki was using to rob these inmates of their money. Though, I do feel that the soundtrack and this season's new "zawas" really help to create a tense mood in this episode. It's always good to watch Kaiji turn things around. He's a lazy, good-for-nothing kind of character that won't move anywhere in society. However, whenever he's neck-deep in trouble while gambling, he always manages come up with a plan to win. I'm looking forward to the next episode to see the trick revealed.